About Our Wine | Wine Tasmania | Welcome to the world of Tasmanian wine. The early migrants from Europe recognised the similarities in Tasmania of the soils and climate with the great grape growing regions of their homelands, and began to challenge and disprove the theory that Tasmania was too far south for grapes to ripen. Today, Tasmania enjoys a global reputation as a leading producer of premium cool climate wines, winning high praise and accolades from wine judges and critics alike. The Tasmanian landscape is dominated by dolerite-capped mountains that shelter the state’s wine regions from high winds and rainfall. On the lower slopes, the vineyard soils are formed from ancient sandstones and mudstones and also from more recent river sediments and igneous rocks of volcanic origin. Tasmania has a moderate maritime climate, cooled by prevailing westerly winds off the Southern Ocean, providing conditions free of extremes in temperature. Mild spring and summer temperatures, with warm autumn days and cool nights allow the grapes to ripen slowly on the vine, resulting in maximum varietal flavour development. This is achieved without losing that essential natural acidity that gives wine both freshness and balance. The Tasmanian vintage usually begins from mid-March, at the peak of the dry autumn when ripening occurs, to late May before the risk of frost and rain. Vintage variations are greater in Tasmania than any other Australian region. This vintage variation is reflected in each unique wine and makes for an insightful tasting of multiple vintages from the same producer. As with any other new business pursuit, it is important to undertake thorough research and planning before investing time, money and effort in a new venture. To this end, Wine Tasmania has developed a range of information to assist anyone considering entering the Tasmanian wine sector, as we are keen to ensure the realities of managing a cool climate vineyard and developing a sustainable wine business are well understood by anyone new to the sector. Download the Investment guide here. For further information, including an investor checklist, details of vineyards for sale and potential partnerships please register your interest here. Please click the links below to discover important industry information, statistics and other relevant documentation. Compare the performance of the Tasmanian and Australian wine sectors, updated August 2018. To access, click here. An independent report into the Tasmanian wine sector has found it conservatively contributes a whopping $115M annually to the Tasmanian economy, placing it in the top ten sectors. View here. Compare the performance of the Tasmanian and Australian wine sectors, updated May 2017. To access, click here. The 2018 winegrape vintage report is now available. To access, click here. The 2017 winegrape vintage report is now available. To access, click here. The 2016 winegrape vintage report is now available. To access, click here. Compare the performance of the Tasmanian and Australian wine sectors, updated March 2015. To access, click here. The 2015 winegrape vintage report is now available. To access, click here. The 2014 winegrape vintage report is now available. To access, click here. The 2013 winegrape vintage report is now available. To access, click here. The 2012 winegrape vintage report is now available. To access, click here. To access the 2011 Tasmanian Vintage Report, click here. To access Tasmanian Wine - 2011 in review, click here. Click here to download a fact sheet on Tasmania's wine sector, including 2010 vintage results. To access a brief 2009 vintage report, click here. Click here to view the 2017 edition of Tasmania's Wine Routes. Click here to view the 2016 edition of Tasmania's Wine Routes. Click here to view the 2015 edition of Tasmania's Wine Routes. Click here to view the 2014 edition of Tasmania's Wine Routes. Click here to view the 2013 edition of Tasmania's Wine Routes. Click here to view the 2012 edition of Tasmania's Wine Routes. Click here to view a PDF version of the 2011 edition of Tasmania's Wine Routes. Click here to view an online version of the 2009/10 edition of Tasmania's Wine Routes. To view a map of the wine growing areas of Tasmania, click here. 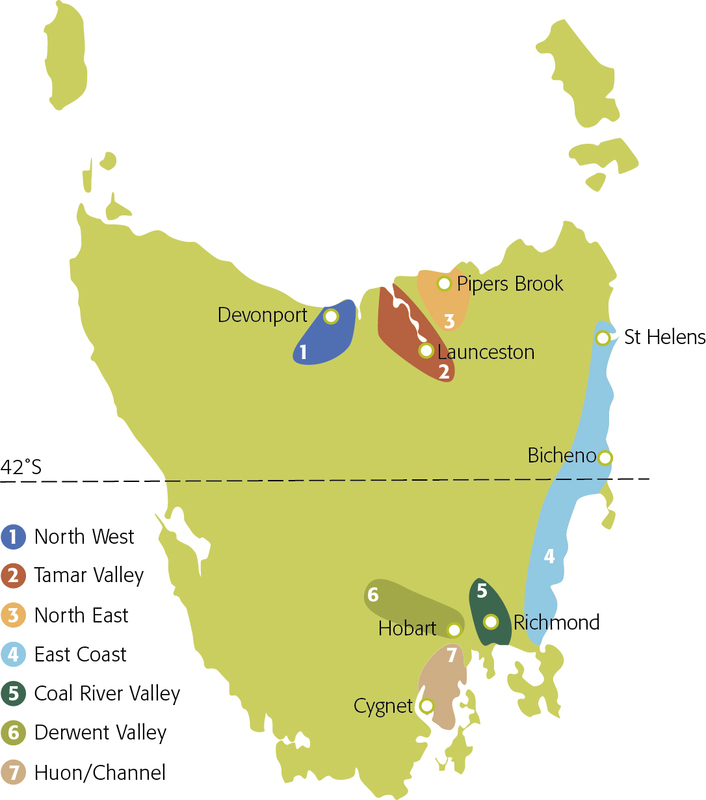 Tasmania has the most diverse soils of any wine region in Australia. Check out what is below the vines... Click here.